The AFA-CWA Board of Directors meeting concluded earlier this week in Atlanta. A full report of the actions of the delegates will be posted at afa-bod.org within 30 days. In the meantime, please review the following for a summary of the meeting. This year all of the delegates wore red AFA pins, demonstrating solidarity for current bargaining for AFA contracts and solidarity for striking 40,000 Verizon workers represented by CWA and IBEW. In uniform, the delegates of the Board stood for the National Anthem sung by AFA Mesa Council 88 member, Elizabeth Maben. AFA members were welcomed to Atlanta by CWA Vice President Richard Honeycutt. CWA President Chris Shelton was represented by CWA Chief of Staff Ron Collins since DOL Secretary Tom Perez called Shelton and the Verizon CEO to the table to settle the strike. The Board watched this video about the strike and recognized that the fight against corporate greed was the same fight we take on in our own bargaining – their fight is our fight. We vowed to do more to support the strike and as we report on the summary of the Board, we are proud to note that moments ago it was announced that there is an agreement in principle reached at Verizon. The AFA International Officers published written reports and addressed the Board. The reports and verbal remarks will also be added to the afa-bod.org website next week. Congressman Frank LoBiondo (R-NJ-02), who also serves as the Chair of the House T&I Aviation Subcommittee, addressed the Board with a welcome video. We do not have a better friend from the House of Representatives in the Republican party than Frank LoBiondo. He has voted with us 100 percent of the time, on rest, human trafficking, Deny NAI, etc. and all issues related to our collective bargaining rights and safety. He is a real Flight Attendant hero and we are proud to partner with him on building bi-partisan support in Congress. The Board reviewed our Fight for 10 and AFA’s effective government affairs strategy. Together, we built a strong coalition with bipartisan support and a massive grassroots advocacy network. The video of the March 16th Rally for Rest was played. Update on FAA Bill: The Senate bill was adopted 95-3. The House bill has been approved by the Transportation & Infrastructure Committee, but has not yet made it to the House floor for vote. At this point the bill could move forward with the Senate bill as foundation and the House committee report as the basis for conference between the two chambers, or the House bill could be presented for a full vote prior to conference between the two chambers. There is pressure to get this done since funding for the FAA ends this summer. However, it is possible Congress could simply adopt an extension and work would begin again in the new Congress next year. While that is not the preferred course, we should note that our work this year to advance our issues will provide a likely path to achieve inclusion of the same issues if we must continue the work into next year. Our advocacy now is to move forward with the bill this year and we took part in a press conference at DCA on May 16th with Senators Klobuchar and Warner to encourage lawmakers to do just that. We will keep up the pressure. AFA-CWA Government Affairs Director Steve Schembs was commended for doing a phenomenal job in leading our legislative work. Produced over 200 comments from Members of Congress to DOT in opposition to the ruling. The DOT reply period ended May 23, 2016 and then there is no deadline for the final ruling. We need to keep up the pressure so that DOT either reverses its position or does not issue a final rule that will set in motion flag of convenience in aviation and ultimately destroy our jobs with it. This is our top priority since everything else flows from it, including our ability to move our careers forward at the bargaining table. AFA Members are encouraged to go to http://www.afacwa.org/denynai to continue to take action. The Board heard from Kenny Hansmire of The National Child Identification Program, a community service initiative dedicated to providing parents and guardians with a tool they can use to help protect their children. The ID Kit allows parents to collect specific information by easily recording the physical characteristics and fingerprints of their children on identification cards that are then kept at home by the parent or guardian. If ever needed, this ID Kit will give authorities vital information to assist their efforts to locate a missing child and save lives. Stan Kiino of AFA SFO Council 11, presented the work of constituency groups PRIDE at Work and the Asian Pacific American Labor Alliance. Stan encouraged AFA leaders and members to join these constituency groups to help build our diverse and strong union. 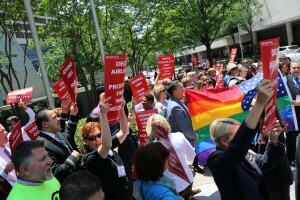 The entire Board of Directors participated in a protest march for equality – focusing on Delta in Atlanta. Delta Connection Flight Attendants are not equally recognized for their contribution as frontline employees of Delta’s network. We marched several blocks to protest outside of the World of Coca-Cola, as Coke’s CFO Kathy Waller sits on Delta’s board. Our message was simply – Inequality Has to Go! The airline industry is raking in billions, at the expense of workers on the frontlines of regional airlines. 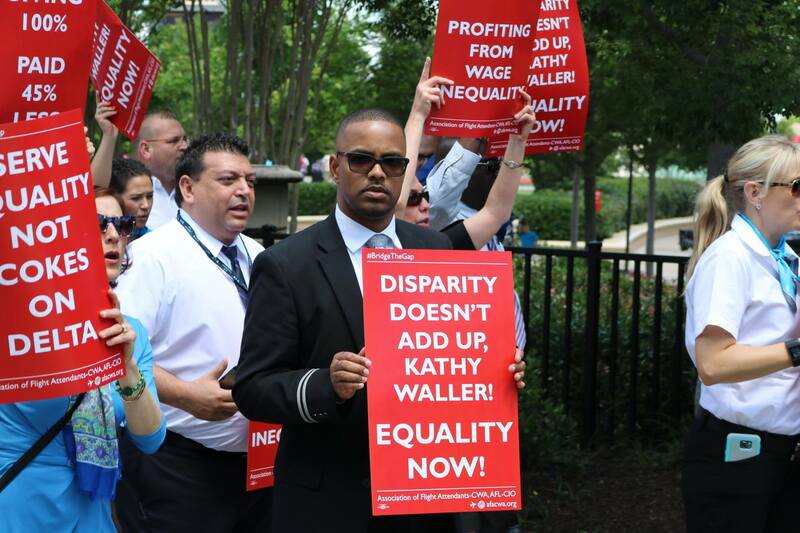 Delta and the other major U.S. carriers are profiting from wage inequality. It’s the same brand, the same passengers buying tickets, but the compensation for Delta Connection’s first responders is 45 percent less. Delta is profiting from wage inequality. AFA recently called on Georgia Governor Deal to veto HB 757, an anti-LGBTQ bill, that would have paved the way for wide-ranging discrimination. For four decades, AFA has promoted equality for all flight attendants, and our union successfully beat back numerous discriminatory practices so that anyone with the heart of a flight attendant can become one. We also marched for this core principle of our union. Bridge the Gap is our campaign to end regional and mainline compensation disparity and lift standards for all Flight Attendants. All Flight Attendants are in jeopardy as long as the disparity exists. AFA Communications Director Christopher Lee unveiled a newsletter sending system custom designed for AFA Locals and MECs. The system seeks to provide reliable delivery of communications to AFA members, a more intuitive subscription process and a user-friendly system for leaders. The focus is to provide reliable, effective communication tools that benefit AFA members. The Leadership Development Committee, Chaired by AFA Local Council 43 President Jaci-Ann Chung, reported out on progress for Advance Leadership Development training for AFA leaders. #1 – Annual Budget: The budget was approved by 10:04 am on Tuesday, May 24th. It provides continued funding for all AFA Locals, MECs and Departments at current levels. #2 – Electronic Balloting: This agenda item was adopted as proposed to address requirements expected this year from the Department of Labor. #3 – Direct Membership Election of Master Executive Councils: This agenda item was adopted as amended. The issue was discussed thoroughly in the agenda committee. The committee approached the issue with an effort to determine what it would take to make MEC officer direct membership election work, and they identified over 20 issues that need to be thoroughly reviewed and addressed in order to produce a proposal that would work with all provisions of the constitution and could be seriously considered by all of the members of AFA. Therefore, the agenda item was referred to the Strategic Planning Committee to conduct a review of the questions and craft an agenda item for the 2017 Board of Directors. It was recognized by the entire Board of Directors that the issues needs a full discussion among members this year to ensure democracy is exercised as we consider changing the structure of AFA, recognizing that AFA has direct membership election of the Local Council Presidents who are the decision-makers of the union. The 2013 Board report on this issue will be published and made available to members along with encouragement to review and thoroughly discuss the agenda item prior to next year’s meeting. #4 – Nomination and Election Process: This agenda item was not adopted but the committee recommended that the issue be taken up by the Strategic Planning Committee this year for possible introduction at a later time. #5 – BOD Meeting – Agenda: This agenda item was adopted. #6 – Continuing Committees: This agenda item was adopted as amended. #7 – Dues Obligation and Elimination of Initiation Fee: This agenda item was adopted as amended. The Board of Directors changed the dues obligation to begin after four full calendar months on the line and eliminated the initiation fee – essentially keeping the payments equal to the initiation fee but allowing for full inclusion in our democracy sooner. The Board recognized that our newest members receive full representation from the first day of service even though due process is not available in the event of termination during probation. The Board also confirmed that if a member is terminated before the end of probation, any dues money paid will be refunded to the terminated Flight Attendant. This takes the control of when members can participate out of the hands of management and strengthens our position at the bargaining table because management must recognize these members as participants in any strike vote or ratification vote. #8 – Prepayment of Annual Dues: Consistent with the 2015 Board, this agenda item was not adopted. #9 – Authority to Establish Local Council: this agenda item was adopted with a substitute motion to refer the issue to the Strategic Planning Committee. #10 – Flight Pay Loss Accountability: This agenda item was adopted as amended to clarify the different lost time procedures at each airline and will be implemented as soon as the program for accounting is finalized in the next two months. #11 – Negotiations Policy, Tips from Onboard Sales: This agenda item was adopted as proposed. #12 – Negotiations Policy, Preamble & First Contracts: This agenda item was adopted as proposed. #13 – Never Forget Honor Guard: This agenda item was adopted as amended to further clarify the Honor Guard. #14 – Study by Strategic Planning Committee: This agenda item was adopted as proposed. #15 – Agency Fee Requirement for Members of Management: This late agenda item refers the issue to a study for feasibility. It was adopted as proposed. The BOD called on Doug Parker to restore the retiree and buddy pass travel benefits that have been lost by the Flight Attendants serving within the American Eagle brand. The BOD recognized the whistleblowers of Council 26 for their unwavering dedication to safety and security of the passengers in our care. We honored AFA staff for their dedication to Flight Attendants. Mark Littleton, Senior Staff Negotiator; Josie Bautista, Senior Staff Attorney; and Scott Goodman, Staff Attorney, were honored for their years of service to Flight Attendants across the union. We thank them for their service to our union and wish them well in future endeavors. The Edith Lauterbach Merit Award, the highest honor in our Union, was awarded to Robert Barrow of Envoy Air. Robert is a worthy recipient of this year’s award due to his work as an Info Rep Co-Chair, CHAOS™ Command Chair, Council 52 Grievance Committee, Local 52 President, and American Eagle MEC President. His body of work and dedication to our union and its members is exemplary. He is an outstanding Union worker and activist who steps up every time to advocate for AFA members and engage in efforts to build solidarity among all workers. The Peggy Price Award was established 16 years ago to recognize the value of our EAP committees’ work and to highlight the outstanding efforts of one local EAP committee. The EAP Committee at United Los Angeles Council 60 at United in Los Angeles won the award this year due to their quality one on one interactions with Flight Attendants. Congratulations to Local Co-Chairs Ernie Cornejo and Yulonda Harriston along with EAP representatives Dean Jacques, Krista Beyer and Jillian Brock. Members who attended the meeting on their own time were recognized and thanked for their participation in the AFA Board meeting. Prior to the start of the Board meeting, the AFA-CWA Executive Board acted to rename United’s JFK Council 5 to EWR Council 6. This change was implemented in response to management’s recent decision to transition domicile operations to EWR from JFK, following the closure of the JFK station. Consistent with prior action of the Board of Directors, which retired Council 6 EWR until operations were re-established at EWR, the transition from JFK Council 5 to EWR Council 6 is in order. This is simply a name change and does not alter the membership of the Council.